Joys of travelling around a beautiful Caribbean island….. While most tourists head to beach resorts (and often don’t move from their sunbeds for a week or a fortnight! ), travelling around Cuba can be really rewarding. If you do your research you can find you have a pristine white beach to yourself, as I found near Trinidad where I watched the sun set and then lay on the sand to take in the magical array of stars in the clear sky. Roads are bumpy, but tourist buses are modern and comfortable with air conditioning. And as you travel across Cuba there’s always something to look at, whether that’s locals outside their ramshackle homes, people heading to work on farms or passengers travelling in open trucks that have been converted into a unique form of bus. There’s also an array of roadside stalls with covered areas where you can stop to enjoy a sandwich before continuing on your journey by bus, so you need not go hungry (or thirsty) on your travels. One of the more interesting places I stopped for a few hours on a trip from Trinidad to Havana was Cienfuegos. Established in 1819 by a French emigré from Louisiana, still gives a feeling of being in France with a magnificent Prado and grand colonial era buildings set around the main plaza (Parque Marti, named after the 19th century hero of Cuban independence and whom there is a statue of here). This vast square boasts a number of bandstands where musicians ply their trade during and palm trees providing shade from the midday sun. Unesco declared the town – known as the “Pearl of the South” – a World Heritage site in 2005 and is financing the restoration of numerous sites. This is much-needed as many of the fine neo-classical buildings – retaining wonderful facades seen above bustling shops at ground level – in the grid arranged seem to be crumbling after years of neglect. The elegant development stretches away from the colonnaded streets in the centre to the marina on a thin slice of land where there are some fine 20th century palaces, which are now used hotels and restaurants. Thankfully a plan to build a nuclear facility here at the height of the Cold War and the serenity of the bay has been retained and its industrial zone has been disguised. 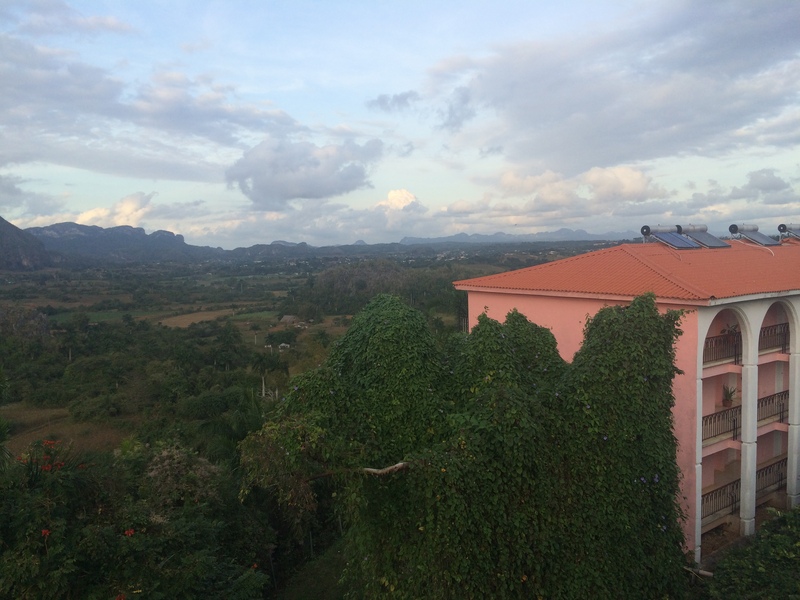 After Cienfuegos we had a long bus journey to Vinales, a small town set in a beautiful valley in the Sierra de los Organos mountain with tobacco plantations, limestone cliffs and palm trees. It really is a compact place with just a few main streets of colourful bungalows where locals – who can be seen socialising on covered porches in front of their homes – let out spare rooms to visitors. Most people come to the town for hiking and other outdoor activities, but there is a vibrant music club (Centro Cultural Polo Montanez) frequented by both tourists and visitors that was packed by 10pm. I enjoyed dancing salsa to the sounds of the house band, before performers entertained with Cuban songs and acts depicting the shocking African slave trade. It was a boozy affair all round with Havana Club being sold quite literally by the bottle. 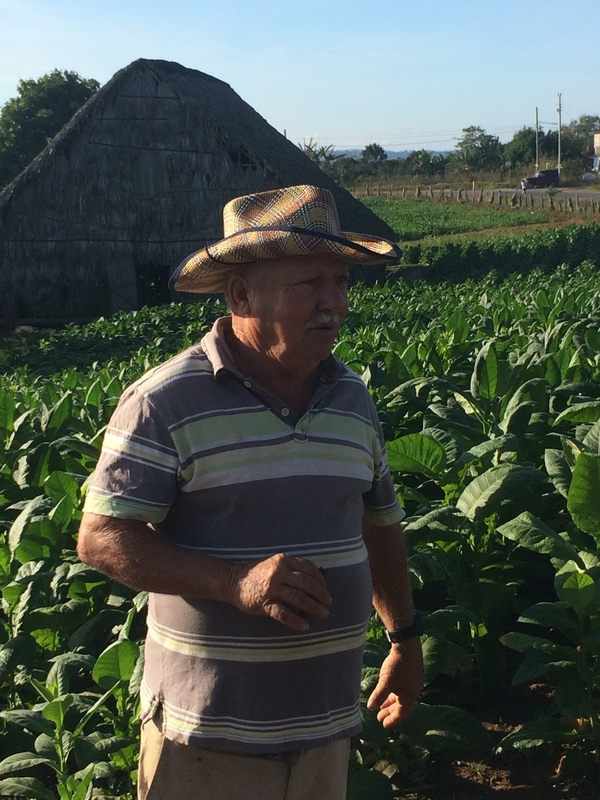 On the outskirts of Vinales farmers are happy to show you their tobacco crop and the drying process where leaves are kept for several months before being rolled into cigars. We met one portly figure who told us he was 75 and had smoked four cigars since age 10, but was in good health. His secret? “Don’t inhale,” the farmer said. In a shed at the back of his house he showed us where he makes cigars for selling to passing visitors. Cigars have been an important product for Cuba ever since Christopher Columbus saw natives smoking rolled up tobacco leaves when he first sailed to the Caribbean island in 1492. And Fidel Castro was often seen puffing on his favourite cigar until he quit in 1985. From Vinales it’s a 45 minute drive to the port where a ferry takes you to the beautiful island of Cayo Levisa, which is surrounded by pristine white sands and turquoise water. 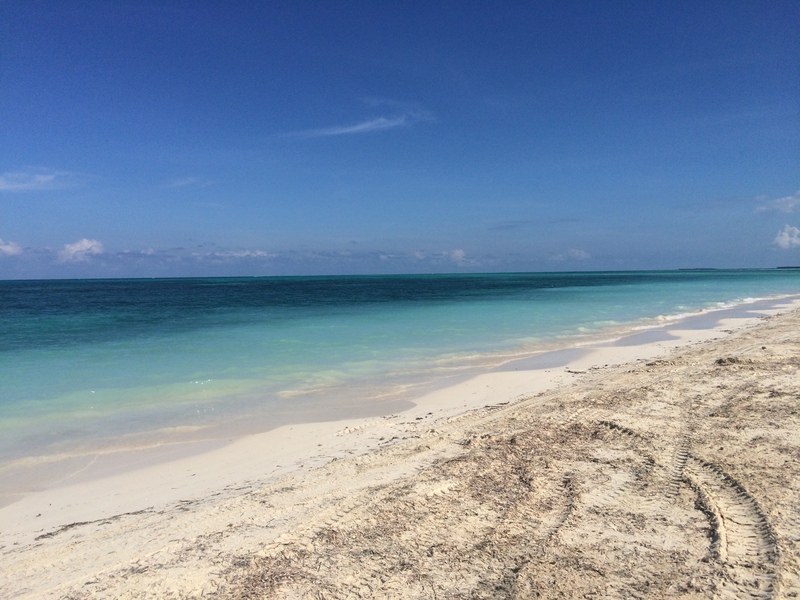 Although some regard it as having the best beach in Cuba, the place doesn’t get overrun with visitors as just a couple of small boats make the 35 minute crossing from the mainland each day. There is a hotel on the island and staff serve (both residents and day guests) a fruit punch after you embark off the ferry. Some of the group headed off to the coral reef and played volleyball, but equally it is a great place to relax in the sun or grab a plate of food at the buffet restaurant. Most seem to congregate on the sunbeds close to the amenities so if you walk a little bit you can have a secluded bay all to yourself. Not everything we saw on our journey was beautiful though. There were also some less inspiring towns that I passed through on my travels around Cuba. They often had filthy toilets and shabby looking cafes, but had useful services such as money changing facilities. And at the edge of main squares – crumbling from years of neglect – I found some wonderful little stalls selling fresh fruit. Nothing can be guaranteed for visitors in Cuba. When you go into restaurants there’s usually a few items that are unavailable. Sometimes you even need to try a few stores to find an item as basic as bottled water. Visitors are also often amused at the age of technology. When I got some money changed, there was a considerable delay at the counter while the clerk waited for the computer to work out what the exchange rate was and how much local currency I should be given. 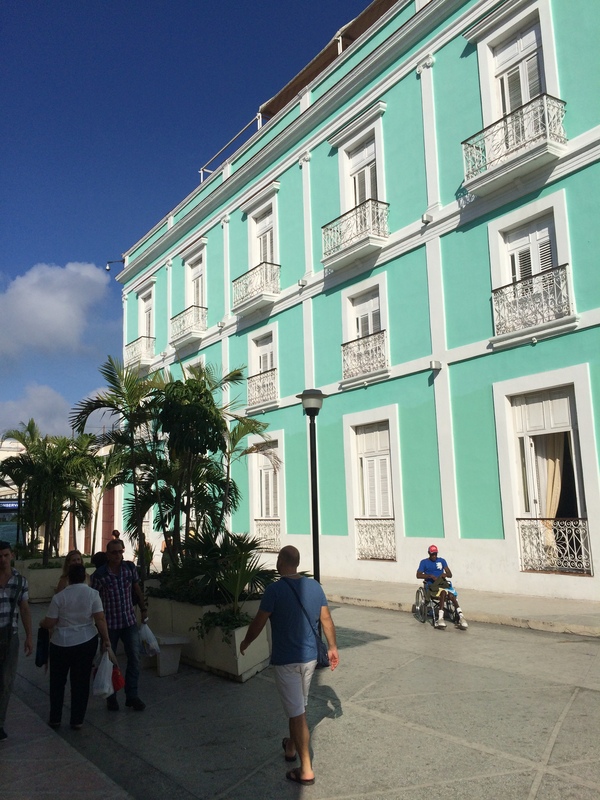 But this sense of entering into a time machine is what makes Cuba so charming to visit. 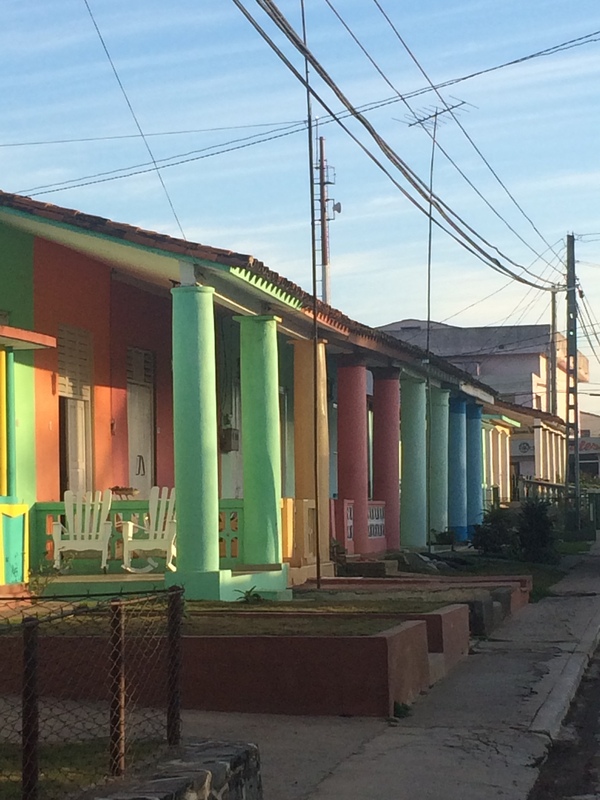 For Cubans, tourism provides an opportunity to build a better futures for everyone. The big question now is whether the country will be able to construct the infrastructure necessary for the expected flood of tourists, if restrictions for US visitors to travel to Cuba are lifted. On Monday: How Cuba was hit hard by the collapse of the Soviet Union and the ways its people get by.